Black is often considered a difficult colour to paint and it was one that I was reluctant to paint for many years. However, recently I have painted large areas of black on quite a few different models and so different methods of painting black have been on my mind of late. As with any painting techniques, there are a number of ways to paint black and those below are just a couple that I have found useful. Remember, there is no right or wrong way to go about painting a particular colour, just whatever works for you. In real life no surface is truly black. By this I mean that black is an absence of all visible light. Any surface that reflects light is not really black in the truest sense. This makes painting black easier as we can see how light plays off ‘black’ surfaces and try to replicate this on our models. If you look closely at black clothes you will see that they often have a blue, grey or even brown hue to them; this is particularly evident if they are old and showing signs of wear. Other objects such as black plastic or metal have a less obvious hue to them and reflect light differently as they tend to be more glossy. When painting part of a model black think about what kind of surface it is and how it reflects the light. Generally speaking, hard surfaces such as armour or weapons will have sharper highlights whereas soft surfaces will need more gradual blending. 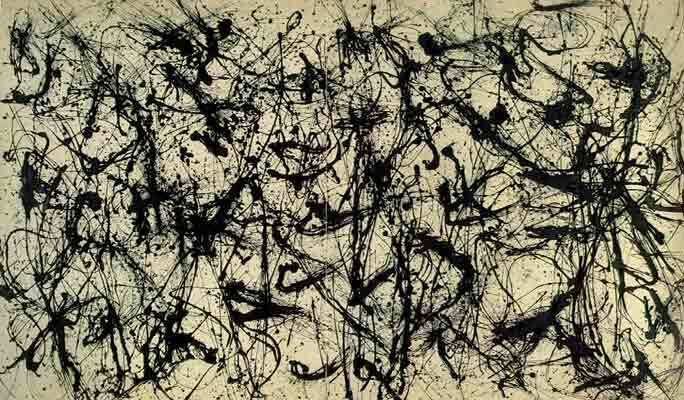 Black is a difficult colour to paint as you cannot shade black – there is no darker paint. As a result it can be flat and lifeless or, if over highlighted, it can end up looking grey. Because of this you should avoid using black as a mid-tone. Instead mix Chaos Black (or whatever other brand of paints you are using) with one or more other colours in order to get a very dark basecoat that appears to be black to the eye but can still be shaded with black paint. When it comes to doing this you will need to consider the overall appearance of the model. In addition to thinking about what kind of material the area you want to represent is made of, think about your overall colour scheme and how the black areas will work with this. Although this may sound odd, what kind of black are you wanting to use? Do you want your black tone to be warm or cold? Are there any other colours on the model that you want to work into the black? For example, my Nazgul and Vampire count are both painted to have areas of black cloth but both use very different tones in order to set the mood of the model. 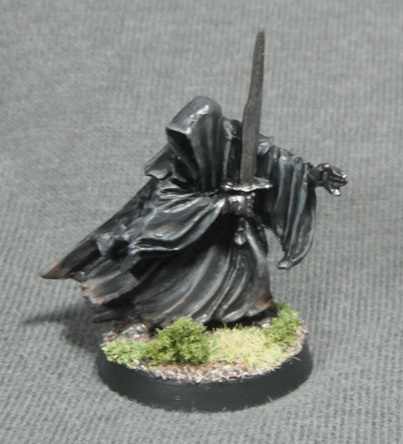 The Nazgul is painted using warm colours in order to achieve a more realistic look to the robes and match the look of the Ringwraiths in the films. The Vampire, on the other hand, was painted with a cold palette in order to give him a lifeless, undead feel. 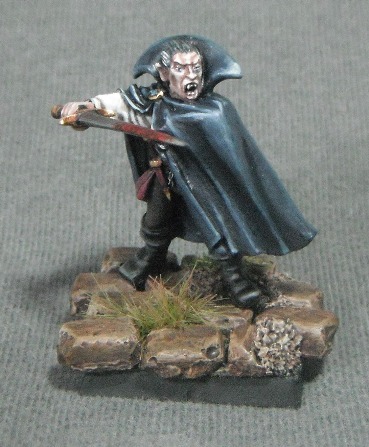 Also, the dark blue of the cloak suggests the night sky – very appropriate for a vampire. 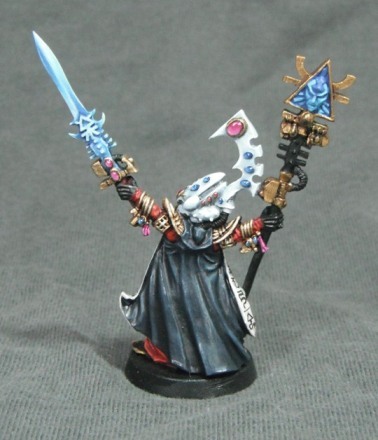 My Eldar Farseer (pictured below) had his cloak painted using the same technique in order to contrast with the warm tones of the red and gold on the rest of the model. The blue tint to the cloak also ties it in with the other areas of blue on the figure. 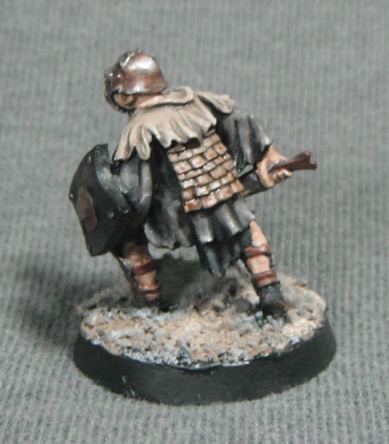 The Nazgul was painted using a mix of Chaos Black and Kommando Khaki which was applied over a Chaos Black undercoat. I painted this on all but the deepest recesses in order to leave some shading. This was then highlighted by adding more Khaki to the mix. This gives a much softer colour than adding white or grey to the mix which could end up looking quite stark. In addition to this, the Khaki paint has less pigment than other Citadel paints and allows colours to be built up gradually in layers. A similar technique was used on some of my other Mordor models. 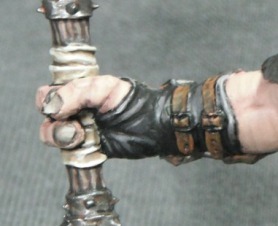 However, the orc’s clothes and the troll’s leather bracer were basecoated with Vallejo Black/Brown (although you could use a 50/50 mix of Chaos Black and Scorched Brown) and highlighted by adding Kommando Khaki. Again, this produces quite a nice, realistic finish. The cloaks on the vampire and Farseer were painted with a 50/50 mix of Regal Blue and Chaos black and shaded with pure Chaos Black. They were then highlighted by adding increasing amounts of Fortress Grey to the original mix. 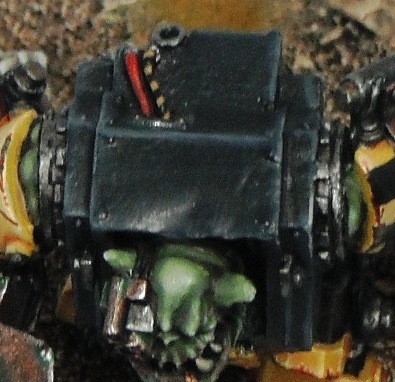 I also used the same technique on the black areas of my Bad Moon ork but with much sharper edge highlights in order to suggest the hardness of the metal. As mentioned above, light reacts differently to different black surfaces and different materials will require different techniques. There are no hard and fast rules here, experimentation is required in order to achieve the effects you are looking for. 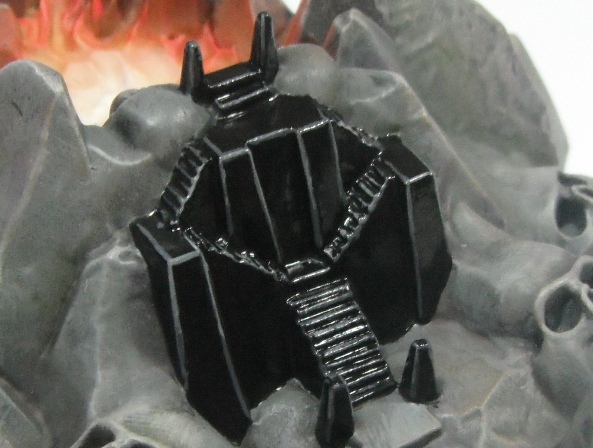 Below is my attempt to paint an obsidian effect on my Dreadfleet volcano temple. As I wanted a really deep black colour I painted the whole thing with Chaos Black and added some extreme edge highlights using Adeptus Battle Grey followed by Codex Grey. This was to emphasis the reflectiveness of the surface and suggest the sharpness of the edges. Finally the whole thing was given a coat of gloss varnish to finish the effect. I hope this post has been useful. As I say, this isn’t so much a guide as my own thoughts on painting black and I hope it helps to provide inspiration and spark your own ideas. If you have your own hints and tips on painting black drop me a line and let me know how you do it, I’m always on the look out for new techniques. I’m working on a black unicorn with purple tones (in addition to purple mane and tail). This blog gives me some ideas on ways to blend for smoother highlights. Thanks!